Ever wanted to know more about watercolor? Having the correct vocabulary can help! A big part of being an artist is knowing the tools and techniques of working in that medium. We put together a list of a few terms, some familiar, some more obscure. Recently, the Brea Gallery hosted a four-day workshop and masterclass with world-renowned watercolorist John Salminen. Students learned techniques and process through demonstrations and personal one-on-one consultations with the instructor. Interspersed with these watercolor terms are a few images from John Salminen's "Urban Realism" workshop. A piece by John Salminen, juror for the 49th Watercolor West International Juried Exhibition. · Dry Brush: a technique that builds vivid colors using a relatively dry paint brush with minimally diluted paints. · Wet into Wet / Wet on Wet: a process in which layers of wet paint are applied upon previously administered, still damp layers. · Rigger Brush: a multipurpose brush with a handle specifically designed to provide precise line application, balance, and comfort when painting. It is the most widely used synthetic watercolor brush. A student in John Salminen's Urban Realism class works from a photo. · Yupo: an alternative to traditional art paper that is 100% recyclable, waterproof, and tree-free. This synthetic paper has attributes and properties that allow watercolorists to create interesting artistic layers. · Synthetic Brushes: brushes made up of man-made bristles such as nylon or other synthetic polyester fibers, designed to mimic the structure and performance of natural hairs at a much lower cost. Unlike natural brushes, they don’t have a cuticle, which makes them great to use with liquid or cream products. · Natural Brushes: brushes made with animal hair, such as squirrel, hog, or badger. A student prepare's their station with their personal art supplies. · Cold Pressed Paper: widely considered as the best paper for beginners, this textured paper contains little bumps and grooves that retain water and pigment. · Hot Pressed Paper: due to its smooth texture, this paper it is the least absorbent. It is best suited for fine, detailed, line work, and inking. · Paper Weight: (i.e. 140 pound paper, 300 pound paper) refers to the thickness and sturdiness of the paper, not actual weight of the sheet. 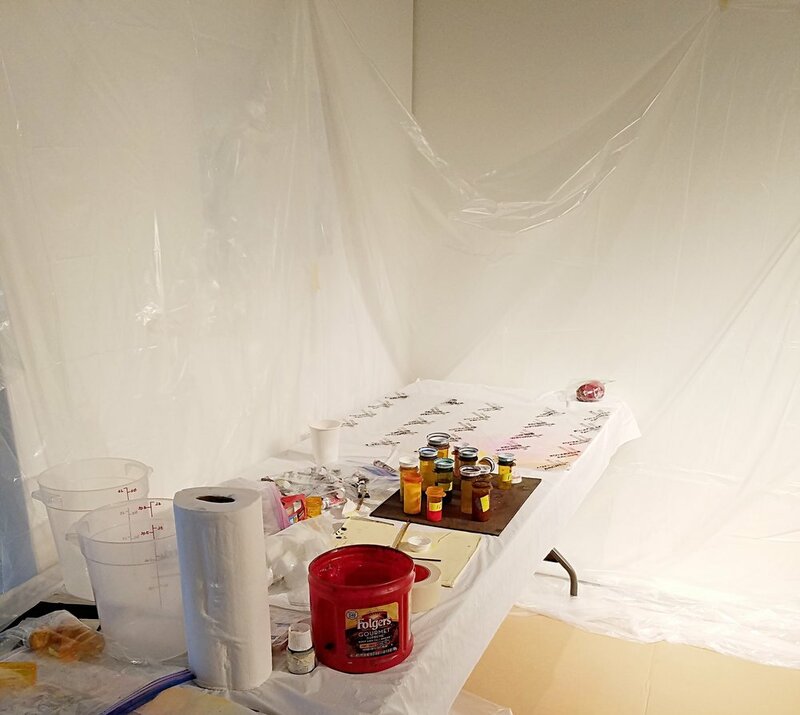 An "atomizing station" allows for students to get messy when experimenting with spraying color on their paintings. · Atomizing/Atomizer: a spray tool that breaks up watercolors into fine particles or droplets. It is the process of breaking up bulk liquids into droplets. · Masking Fluid: also known as liquid frisket, is a tool to preserve white areas too tiny or complex to paint around. Before paint is applied to the paper, masking tape blocks out the spaces the artist doesn't want color. · Thumbnail Sketch: a small drawing on paper (usually part of a larger group) used to explore multiple ideas, quickly. Usually created in preparation for a painting. A quick side-sketch while working on the final image. · Transparent Watercolor: paint that allows the white surface of the paper or underpainting to show through. Versus opaque watercolor paints, such as whites, blacks, and shades of red that completely cover the paper or other paints. · Pigment: A substance used as coloring. Dry coloring matter, usually an insoluble powder, to be mixed with water, oil, or another base to produce paint and similar products. · Lifting: (i.e. removing paint from the paper) a technique used to clear water and remove pant with by carefully blotting a or gentle scrubbing motion. · Opaque: impenetrable to light; not allowing light to pass through. These paints are relatively chalky in appearance when dry. Opaque paints fairly effectively block out the colors behind them. · Charging: technique that involves mixing two or more colors directly on the paper instead of premixing on a palette. · Flat Wash: brushing successive strokes of color on a wet or dry surface, with each stroke placed next to the other to create an even layer of color. · Glazing: applying thin, transparent washes of one color over another color. · Layering: applying premixed colors over another wash to change its value or intensity. · Palette Knife: a small spatula-style knife used to apply or remove paint, or to add texture. · Staining Colors – colors that absorb into the paper before the water has had a chance to evaporate. These colors are difficult to lift and will leave a stain on the paper. · Temperature: the warmness or coolness of a color, depending on where the color is situated on the color wheel. And you thought that blue was just blue. · Variegated Wash: a type of wet-into-wet wash that involves placing colors side by side and then mixing and blending them along their edges. · Wet-into-Dry Wash: also known as a glaze or layering wash; a wash that is applied to a dry surface. Autumn High Line by John Salminen is currently on display in our Watercolor West exhibit. That's a quick, short list that will get you started in the world of watercolor. Now you're ready to take a class and start creating your own masterpieces!